Our Rickety Public Defense System Has Finally Collapsed. Here’s How to Fix It. The right to counsel is unique in American law, and there is no clear blueprint for how such a right is supposed to be enforced. Until recently, Vermilion Parish, Louisiana—a Cajun enclave on the Gulf of Mexico—had 10 public defenders to represent poor people facing criminal charges. Now, after a round of layoffs, Natasha George is the only one. As The New York Times recently reported, George has little choice but to place most of her would-be clients on a wait list. Instead of the speedy and fair proceedings guaranteed by the Constitution, they have no way of knowing when their cases will be resolved. In New Orleans, which also suffers from a shortage of public defenders, a judge recently ordered the release of several defendants who have spent a year in jail awaiting the appointment of counsel. And in Baton Rouge, public defenders have threatened to begin refusing new cases this summer, if predicted budget shortfalls materialize. Throughout Louisiana, public defenders are operating in a state of crisis. This article originally appeared at TalkPoverty.org. In some ways, the state’s indigent-defense emergency is unique and extreme. Louisiana has never had a robust public-defender system—in fact, it is the only state that attempts to fund this core government function largely through traffic tickets. And as the state struggles to recover from Bobby Jindal’s disastrous tenure as governor, this already rickety framework is now collapsing. But difficult conditions for public defenders are neither new nor limited to Louisiana. Throughout the United States, public defenders have used the word “crisis” for decades as shorthand for the combination of volatile funding, understaffing, and excessive per-lawyer caseloads that has persistently plagued many defender offices. In my recent article in the Columbia Law Review, “What Gideon Did,” I examined the grassroots effects of Gideon v. Wainwright, the landmark 1963 Supreme Court decision that established a constitutional right to state-provided counsel in criminal cases. For a number of structural reasons, state-level funding for Gideon’s implementation has proven unpredictable in the best of times, and susceptible to collapse in the worst of times, as defendants in Louisiana can attest. Given this history, Congress should step in to secure the Gideon guarantee with federal funding, so that defenders like Natasha George—and the poor people they serve—are not so vulnerable to the politics of state budgets. Almost as soon as Gideon was decided, lawyers began to describe their working conditions as a “crisis.” While a few states, like California, had longstanding public-defender offices established decades before Gideon, lawyers in most states set out to establish and expand defender offices. However, the available funding never kept pace with the growing demand. These funding realities contrasted with defenders’ interpretation that Gideon required them to serve as many clients as possible—a noble aim, but one that quickly produced dissatisfaction in lawyers and clients alike, as defenders’ caseloads spiraled upwards. I found, for instance, that in Massachusetts, the state public-defender agency went from handling about 18,000 cases a year in 1968 to about 42,000 cases a year in 1972—a figure that would only continue to climb thereafter. The persistence of crisis conditions in indigent defense suggests that the causes are deeply entrenched, and not a temporary reflection of shifting political views or economic vicissitudes. One long-term historical factor helping to explain America’s weak commitment to indigent defense is the legal profession’s own prestige hierarchy, which has long valorized advising corporations more than helping ordinary people. A second factor undermining indigent defense is simply the structure of American federalism. The New Orleans judge who recently ordered the release of defendants awaiting counsel wrote, by way of explanation, that “constitutional rights are not contingent on budget demands.” But in practice, constitutional rights are often hamstrung by state-level budgets. For much of the 20th century, elite lawyers in many parts of the United States did not consider defending poor people to constitute a respectable professional niche—it was neither lucrative nor, in elite jurists’ view, particularly intellectually challenging. Rather, indigent defense was often described as a suitable training exercise for young lawyers—a way to gain courtroom experience and maybe do some good for the community before they moved on to their “real” careers. In order to quantify this phenomenon, I looked through Harvard Law School alumni directories for the class of 1958. Among those who had volunteered as law students with Boston’s local public-defender equivalent, none were working as public defenders 10 years later, and only one was working in government service. There were geographic exceptions to this pattern, but in the many regions that had no strong tradition of career public defenders when Gideon was decided, Gideon’s implementation had to start from scratch. Fortunately, lawyers’ own attitudes about indigent defense have changed in recent decades. Over time, lawyers have reimagined indigent defense as a respected practice specialty—not just training for a future career, but a career in its own right. Jane Kelly, the Iowa federal judge whom Obama recently floated as a possible Supreme Court nominee, embodies this shift. Kelly spent many years working as a public defender in the federal system. After her name appeared on Obama’s rumored short list, conservative media outlets subjected Kelly to despicable personal attacks, maligning her for representing “infamous criminals.” Nevertheless, Kelly’s very presence on court-watchers’ radar suggests that most of the American legal community now considers public defense a respectable background for a judicial nominee. To be sure, indigent defense is not the typical legal vocation, but law schools do provide support for students interested in this work, and hiring for some defender offices is extremely competitive. In particular, the organization Gideon’s Promise has an excellent record of partnering with law schools to place graduates in public-defender offices in the Deep South, where the need is especially acute. Funding, however, remains a constant headache for defender offices around the country, which is symptomatic of a larger issue—the mismatch between the requirements of American constitutional law and the federalist structure of American government. It is easy, and often quite justifiable, to blame state legislators for stingy appropriations for public defenders. But state legislators work within a system that permits them to get away with underfunding indigent defense. The Supreme Court has never specified how exactly Gideon is supposed to be implemented. And although states can be punished after the fact if they fail to provide individual defendants with effective counsel, in the form of reversed convictions or habeas relief (although in practice even those remedies are hard to win), the Court has never translated Gideon into forward-looking standards for how states are supposed to structure and fund their indigent-defense systems. It is not surprising that the Court has failed to set clearer standards. The right to counsel is unique in American law—it’s one of the few federal rights to positive government assistance, as opposed to a negative right against government interference—and there is no clear blueprint for how such a right is supposed to be judicially enforced. 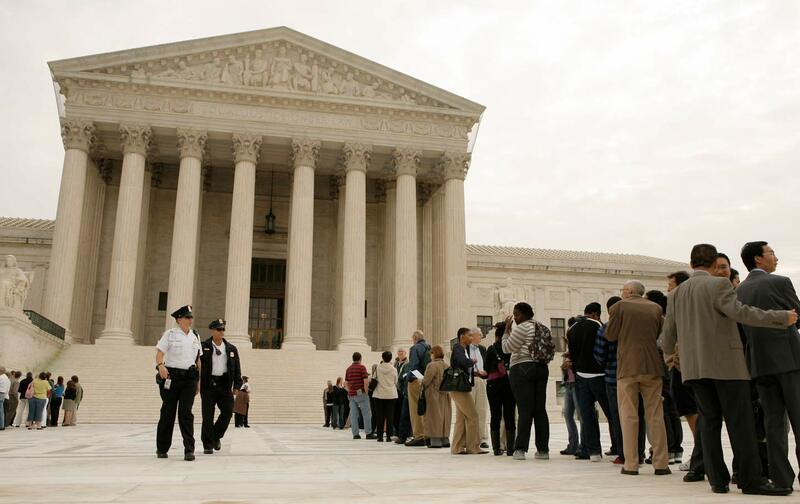 Moreover, the justices are typically reluctant to micromanage state criminal-justice systems. Nevertheless, the result is that public defenders have been left in the wake of Gideon to cobble together funding from an ever-fluctuating mix of sources. In New Orleans, the ACLU has filed a civil-rights lawsuit challenging the public-defender shortage as a systematic violation of defendants’ rights to counsel, due process, and equal protection. This litigation builds on efforts nationwide, since the 1980s, to use class-action litigation to spur indigent defense reform. For example, two years ago, Governor Andrew Cuomo reached a settlement agreement with plaintiffs challenging New York’s indigent-defense system. On the whole, however, such lawsuits have met with mixed success. As a more promising nationwide solution, Congress could establish a dedicated source of federal funding for local and state public defender offices. In 1979, Senator Ted Kennedy introduced legislation, based on an ABA proposal, to establish a permanent Center for Defense Services to administer federal grants and enforce minimum quality standards for indigent defense. At the time, the bill made no progress, but given the current political momentum for criminal-justice reform, Congress should revive the idea. John Pfaff, a law professor at Fordham University who studies criminal justice from an economic perspective, recently estimated that a congressional appropriation of just $4 billion—a minuscule sliver of federal discretionary spending—would have the effect of instantly tripling indigent-defense resources nationwide. An infusion of federal funds into local defender offices could have ripple effects beyond alleviating emergencies in states like Louisiana. Every issue on criminal-justice activists’ agenda—from excessive bail to draconian sentencing—is one where public defenders could make headway through their advocacy in individual cases, if they had the necessary resources. But more fundamentally, the rights of poor people, wherever they happen to live, should not be abandoned to the whims of state legislators. All Americans should be able to depend on federal support for what is, after all, a federal constitutional guarantee. Sara MayeuxSara Mayeux is the Sharswood Fellow at the University of Pennsylvania Law School.